Our last captain in the VFA. Captain of Carlton in 1895 and 1896 (the club’s last two seasons in the Victorian Football Association) Tom Blake relinquished the leadership of the team to Jimmy Aitken when the Blues made their bold foray into the Victorian Football League in 1897. Blake led Carlton’s rucks into battle against Fitzroy at the Brunswick St Oval when the VFL was born on Saturday, May 8, 1897, only to leave Princes Park in unexplained circumstances just a few weeks later. After suffering defeat in each of Carlton’s first four games, his only experience of playing in a winning Carlton team came against St Kilda in round six of the season at the Junction Oval. That spiteful affair was Blake’s last match for Carlton, and resulted in an 11-point win to the Blues. In fact, St Kilda was the other team that figured large throughout Tom Blake’s football career. He had been born in the bayside suburb, played junior football for St Kilda Royals, and later joined the Saints’ VFA team, before he crossed to Carlton to become captain of the Navy Blues. After leaving Princes Park, Blake spent a season out of the game. He was then talked into a comeback in 1899 for yes – St Kilda. The struggling Saints had been anchored on the bottom of the VFL ladder for two years and were crying out for experience and leadership. Tom Blake heeded the call from his old club, and helped to provide these qualities in 24 handy matches over two seasons. His brother J.J. Blake played for Carlton and St.Kilda in the V.F.A. Like the Blues players 110 years later, Tom Blake did not enjoy a successful Carlton era. In his playing career with the Blues from mid 1892 until early 1897 when he retired, the team only won 14 games losing 45 and drawing 4. 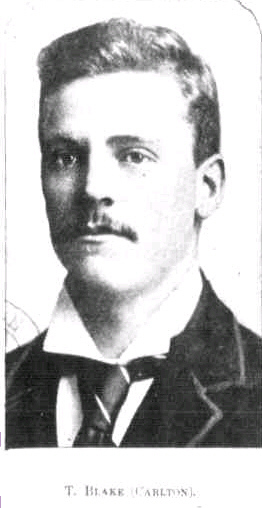 Tom Blake became The Blues' skipper at the Carlton AGM on April 5, 1895. Blake was aged just 22 years and 263 days. Games; Not all of the Carlton teams have, as yet been found. Goals*; Not all goal scorers published. Blake possibly made his debut for the Blues aged 20 years, 15 days, in the game against Williamstown on the Williamstown C. G.
He was named in the 22 man squad, 20 played. The game report was very brief with no goal scorers or any players mentioned. Blake was named in the remaining seven games for 1892. Next week, Blake is named in the squad of 23 for the Essendon game on the M.C.G. He does not appear amongst the 18 named players of the 20 who are mentioned in the reports. Blake, who is the brother of a former Carlton player J. J. Blake, scored a goal in the victory over Footscray on the Warehousemen's Ground in St.Kilda Road. If this was his debut then he would have been aged 20 years, 29 days. "T. Blake holds the cross-country championship of Victoria for the year 1893-94. He has been a member of Collegians for some time, and ran second last year to E. M. Wilson. Blake holds the five miles cross-country record for the colony. He has been a prominent playing member for the Carlton football team all this winter, and has proved himself a good all-round athlete." 1893 CFC Annual Report, Tom Blake scored 3 goals during the season. 1894 Tom Blake played his best game against Fitzroy at the M.C.G. on May 26. 1894 Among Carlton's best players for the year. Blues captain Tom Blake did not play in the final match of the season against St. Kilda which ended in a draw. He was running in the 10 mile cross country championship which he won in the time of 59 mins. 44 1/2 secs. A report said the ground was very heavy and a number of fences had to be jumped. 1895 A noted cross country runner and one of the finest followers in the game, led the side well and was one of the outstanding Carlton players in 1895. Carlton played Williamstown at the University ground, the Blues lost. "Tom Blake was most conspicuous amongst the followers and the good, solid games he plays has become as notable as Carlton's failures to score points." 1896 Among the players seen as a nucleus of a strong combination. 1896 Tom Blake was the reining Victorian Cross Country Champion. A few times during the football seasons he did not play for the Blues as he was competing in an atheltics meeting. Tom Blake running for the Collegians club, came third in the ten mile run with a time of 60 minutes and 50 seconds. 1893; 63 minutes 34 seconds. 1895; 59 minutes 44.5 seconds. "Tom" Blake the well known Carlton Captain, an old Wesley Collegians player, won the Kew Harriers 7 mile race last Saturday in splendid time. Tom Blake joined St. Kilda and played 24 V.F.L. games for the club between 1898 - 1900. Playing against the Blues on August 20, Tom copped plenty of attention from his former team mates and received plenty of free kicks. Tom Blake passed away in May, aged 63. "The news of the death of Mr. Tom Blake, the captain of the Carlton Football Club in 1895 and amateur 10 miles cross country champion of Victoria in 1893 and 1895, will be received with regret. Mr. Blake was a member of a very fine athletic family. His brother Mr. George Blake was also the 10 miles champion of Victoria, winning in 1900, and representing Australia at the Olympic Games. Another brother Mr. Harry Blake was a well known cross country runner, and another Mr. J. James J. Blake played football for Carlton and St.Kilda. Mr. Blake was associated with the firm of McEvoy and Co. for very many years. He leaves a widow and two children." Contributors to this page: blueycarlton , Jarusa , pblue , molsey , Bombasheldon , PatsFitztrick , tmd1 , p(12)terg , true_blue24 , keogh and admin . Page last modified on Thursday 31 of August, 2017 14:48:05 AEST by blueycarlton. 1996 - Brad Pearce & new footy fashion (26/06/96).